Blogging is a fantastic way for you to take control of your career. It allows you to choose the topics that you would like to write about and gives you the freedom to work from home. If you’re eager to build up a reliable readership then it’s vital that they can also rely on you. Your audience is likely to switch off if they can’t depend on you to make regular posts. If you are determined to make a success of your online platform, you’ll need to read on. 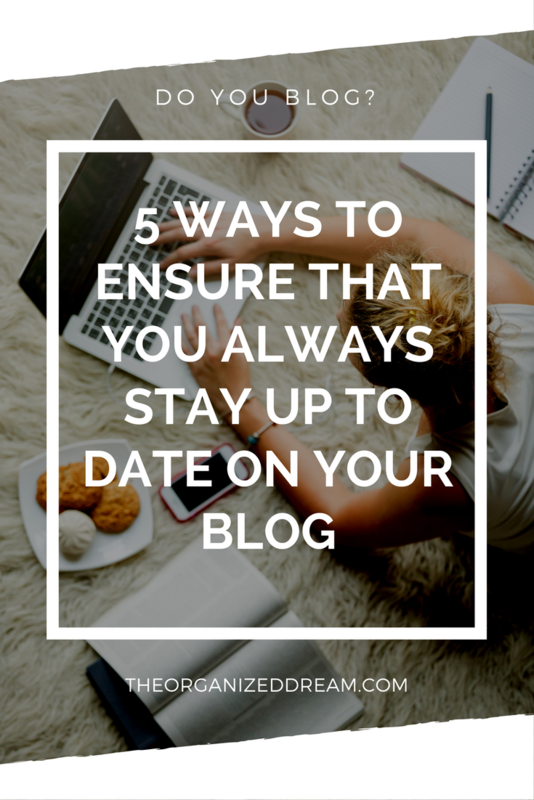 Below are five ways to ensure that you always stay up to date with your blog. If you live in an area that struggles with really bad internet connection, this may be interfering with your blog. Luckily, there is always something to be done. Why not call up your provider and work towards a solution? They might be able to provide you with some advice on how to speed up your connection. Alternatively, they may offer an update package that promises a better service. This will be cost you, but it could make it so much easier for you to run your blog. When you’re your own boss, it can be hard to stay motivated all the time. That is why you need to hold yourself accountable. Make sure that you have a clear plan for the day ahead. This will ensure that you’re getting as much done as possible. You should also schedule in set breaks, as this will stop you from taking too much time off from work. Another way for you to stay motivated is by writing about topics that really excite you. Try to be honest with your readers about what you love. Even if a subject is a little off brand, it might be worth exploring from time to time. Your blog should be an extension of yourself, so it’s important that you trust your creative instincts. If you’re scheduled to upload a blog post, the last thing that you want is for something to go wrong with your data. If this happens, MySQL data recovery is a great way for you to avoid any downtime after a data loss disaster. Instead of your online platform screeching to a halt, you’ll be able to work around the problem until it’s resolved. The fact that you’re working from home shouldn’t stand in the way of you enjoying an efficient office space to work in. If you’re determined to take your blogging career seriously, you’ll need to create your own office space. This is a fantastic way for you maintain an air of professionalism in your own home. It will also help you to work more effectively and focus on meeting your deadlines.